Výkonný kultivátor s 4 taktním motorem Hecht OHV o objemu 196 cm3. Volitelný pracovní záběr 32/50/84 cm. Petrol powered tiller equipped with HECHT 2 stroke engine, 43 cc. Working width 23,5 cm. 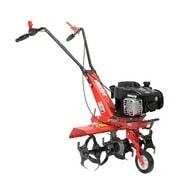 Petrol powered tiller equipped with Briggs & Stratton CR 950 engine. Working width 32/50/84 cm, 2/4/6 pcs of plough skives with 38 cm diameter. 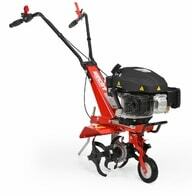 Petrol powered tiller equipped with HECHT 4-stroke engine with an power output of 6,5 HP. Working width 50 cm. Cultivation knives with diameter of 34 cm. 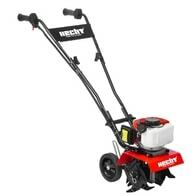 Motor gasoline tiller powered by 4-stroke engine HECHT with displacement of 208 cc. 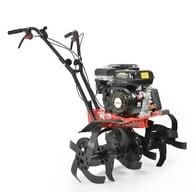 Working width is 81/104 cm - 6 pcs tines. 3 forward speeds and one reverse speed. .